Documenting atmospheric changes in eclipse on Io, the innermost of the four Galilean moons of the planet Jupiter, has always been a challenging job. The darkness caused by planet’s shadow makes it impossible to observe atmosphere on its moon. Nevertheless, a Southwest Research Institute-led team has taken the first leap in surfacing the changes in the geologically active moon. 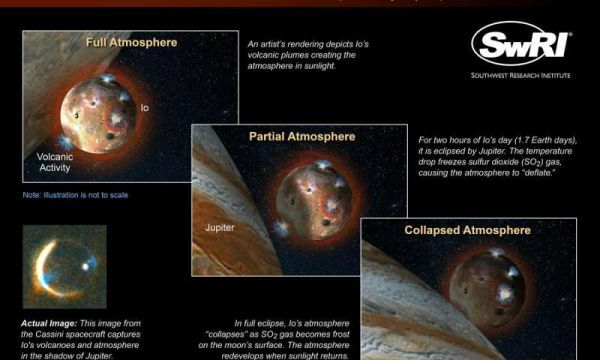 Io’s surface primarily is sodden with sulfur dioxide (SO2) gas, which is an offshoot of presence of active volcanoes. The effect of daily eclipses morphs the sulfur dioxide gas into ice. No sooner the eclipse phenomenon gets over, the process of sublimation, ice collapsing into gas, takes place. Data showed that the collapsing of atmosphere takes place when the temperature drops from -235 degrees Fahrenheit in sunlight to -270 degrees Fahrenheit during eclipse. The eclipse takes place on every day for nearly 2 hours on Io. 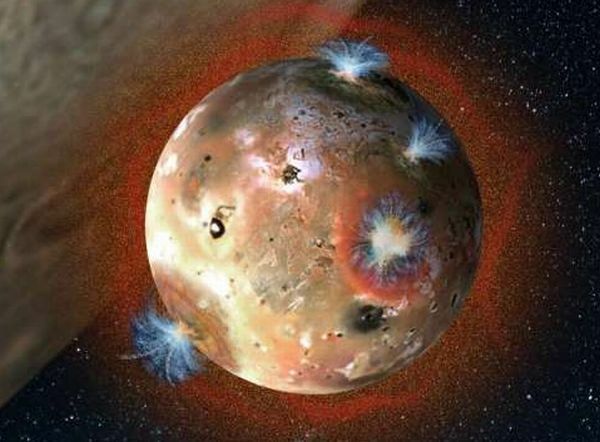 Io takes 1.77 Earth-days to orbit Jupiter. So every time during full eclipse, the atmosphere on the moon morphs into frost and redevelops into gas when it gets exposure to sunlight, thus forming a daily cyclic process of collapsing and repairing. 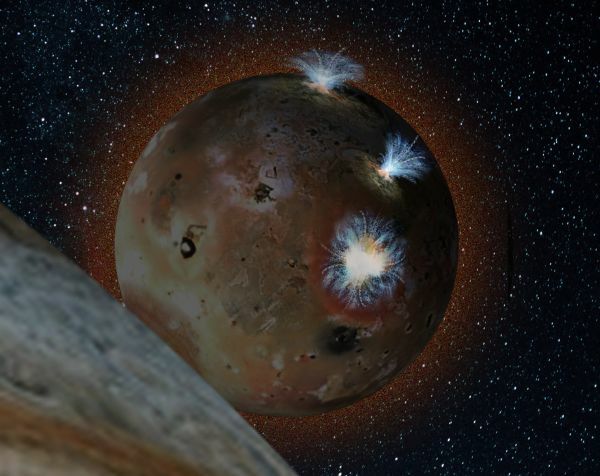 Researchers added that Io’s atmosphere is saturated with SO2 gas that is continuously replenished by hyperactive volcanoes. However, the atmospheric pressure is controlled by sunlight on a daily basis. This is for the first time that such an observation has been made. Studying the atmospheric changes in the darkness caused by the planet’s shadow was not possible before. Instead of relying on sunlight, the team used heat radiation. Along with Gemini telescope that identified the weak heat impression of the moon’s crumpling atmosphere. The spewing out of gas after the eclipse not only gives an auroral impression but also fills the Jupiter system. Understanding how these emissions are controlled would give a better insight into the working of the planet’s system. And it is especially the right moment when Juno is moving in the same direction of research and development of Jupiter system.